Round brilliant cut diamond featured in a four claw setting, with an open gallery optimizing the amount of light to pass through your diamond. Accentuated by the added subtle sparkle of round brilliant cut diamonds micro claw set in each shoulder. 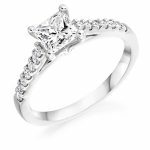 One of our most sought after choices of engagement ring.